Bulgaria/Orpheus Sang — The World According to WSB. Articles. Blog. Books. Modernist mausoleums, Shamanic trance tombs, powerful red wines, dancing yeti men and a trip to the Underworld, Bulgaria is only overlooked by those not in the know. We tried and tried, but we couldn't get inside.... The long-abandoned House-Monument of the Communist Party, Buzludzha, Bulgaria. What we needed to get across was an icy saddle some 1200 metres up in the Balkan Mountains. Our destination lay on the other side and a few hundred metres further up. A massive concrete flying saucer-shaped building, behind which loomed a slender tower with the old Red star etched into either side, Buzludzha dominated the hilltop. Even from here, there were signs it had seen better days. Built at the apogee of Bulgarian Communism, under then general secretary, Todor Zhivkov, this monument to the Party’s founders opened in 1981. Less than a decade later, it was abandoned, as Bulgaria, along with the rest of Eastern Europe, began its transition towards democracy. I did wonder briefly if it was worth that risk. Buzludzha hadn’t been on our itinerary. Technically, we were on our way to the village of Gela, up in the Rhodope Mountains that run along the old Iron Curtain border with Greece. But the drive from Sofia was littered with so much temptation, that rather than take the short route, we’d detoured through the town of Kazanluk and the Valley of the Thracian Rulers, to marvel at 2,300 year old rock-cut tombs, some of them still brightly frescoed. It was as we were on our way to Shushmanets, a temple turned tomb, where the ancient priestly class would lock themselves in the dark for three-day meditation sessions, that I spotted the monument. Even from below, it was magnificent, louring over the valley. A tomb too, albeit of a more modern kind. I’d been itching to have a look inside Buzludzha ever since I came across photos taken the previous winter of its ruined interior on some urban exploration site. Despite the post-apocalyptic splendour - fallen ceiling, gaping holes and crumbling seating - the heroic mosaics were largely intact, as was the giant red and green hammer and sickle emblem on the ceiling. Yes, I thought as I fastened my seat belt, it was worth a try. Dimitr hit the accelerator. Kicking up a slurry of icy mud and yellowed turf, the Land Rover roared forward. Thirty seconds later, after sliding towards the aforementioned ditch a couple of times, we were across. From here on, the slope was mostly bare, stripped of snow by the ferocious wind. A few minutes later, I was racing up the front steps towards the main entrance. Of course, it was locked. Chained shut. I circumambulated the building, as though it were some kind of Communist Ka’aba, looking for somewhere I could climb up or squeeze through. To no avail. The windows, all smashed, were plated shut and the only logical way in, a small platform halfway up one of the side walls, would need a rope or ladder to reach. In the end, the only glimpse I had of that ruined interior was through a small hole in the steel plating at the main entrance. I was tempted to linger but the clouds were closing in and the wind was picking up. Freezing, I conceded defeat. The Descent into the Underworld. The Dyavolsko Garlo, or Devil's Throat in Bulgaria's Rhodope Mountains. Had there been a staircase back then, this would have been one of the last impressions of Orpheus that Eurydice had, before returning to Hades. As we drove away, my disappointment was mitigated by the fact that while I hadn’t managed to get inside, there had been something about the whole experience – Dimitr’s gung-ho approach, the trouble we had getting there, knowing that what we were doing was probably mildly illegal - that reminded me of the freewheeling sense freedom I remember from my first years in Lebanon. So two hours later, as we drew into the garage beside our destination, an improbable oasis of luxury in most rural Bulgaria called the Villa Gella, I was riding a high. The drive had helped. Bulgaria is visibly poor and largely rural. You see the kinds of lined, weathered faces here that prosperity and rich diets have erased elsewhere in Europe. Buildings are dilapidated. Horse and donkey carts are still common. You even see them in Sofia. This material poverty, an ephemeral condition, contrasts starkly with the country’s historical, natural and cultural wealth. Glorious churches with blazing icons, ancient cities that are architectural palimpsests, testimony to thousands of years of invasion and occupation, stately Sinan-esque mosques and Beaux Arts synagogues, thickly-forested mountains, home to bears, wolves, eagles and all manner of wild beast and Black Sea beaches, beautiful despite the massive resorts built along them under Pax Sovietica. Bulgaria was a revelation - to borrow neighbouring Montenegro’s tag line, a ‘wild beauty’ - a pocket of old Europe and of old European cordiality. As we left the plains at Asenovgrad and snaked our way up into the mountains, passing Byzantine monasteries, a 13th Century fortress and countless signs pointing to some ruined castle, church or temple, we were following the course of the Chepelare. According to Dimitr, this road had been used by travellers between the Balkans and Greece for the last 3,000 years, possibly longer. Gradually, the valley narrowed and the forests closed in and as night fell, often the only lights visible were those of passing cars. Villa Gella, though, was aglow. Traditional from the outside, it was a sleek, white beauty inside; modern furnishings, artwork from Bulgaria and further afield, roaring fires and 6 en-suite bedrooms, each different in layout and design. Public areas were organised to encourage mixing, whether in the Library, the living room, on the terrace or even in the sauna and swimming pool on the lowest level. Sat on a steeply sloping site, it commanded panoramic views over the surrounding mountainscape. Managed by the unflappable Darina Dobreva, the niece of owners, Dimka and Ivan, the Gella was the reason for my visit. That and Kukeri, an ancient spring festival with its roots firmly (and visibly) in the pagan past. Celebrated all over Bulgaria, the festival in Shiroka Laka – a convenient 10-minute drive from the Gella – is considered the most traditional. I’d seen some footage of the previous year’s performances online and had been mesmerised. Dancers dressed as animal spirits, soldiers and peasants, men in bad drag as women and women in even worse drag as Orthodox priests, jingling and jangling their way through funny/grotesque performances revolving around death and child-birth - the end of one season and the beginning of another. All that was still two days away. For this, our first night, we had an evening of eating and (I hoped) drinking, ahead. Dimka and Ivan also own vineyards on the slopes of Mount Sakar and produce certified organic wines under the Terra Tangra label. I’d sampled a bottle of their Rosé in Sofia and was looking forward to trying some of their other vintages. I wasn’t disappointed. Over dinner, a seemingly simple spread of country fare, innovatively tweaked by Dimka and bordering on the gourmet, Darina popped the cork on a bottle of Yatrus, their Syrah. Smooth but powerful, the tannin burn chased away the last of the day’s chill. Bed beckoned. The next morning, we drove to Hell. Or more accurately, to Hades. Lake Avernus, Derweze, Glastonbury Tor, Mount Osore, the Underworld has many points of access, dotted all over the world but for the ancient Greeks, Hell’s main hall was to be found in a cave in the Rhodope, called the Devil’s Throat. It was here that Orpheus, the mythical Thracian musician, poet and prophet, came to persuade the Lord and Lady of Hades to bring his wife, Eurydice back from the dead. A local lad – Gela claims him as theirs – Orpheus was so skilled a musician that nothing living could resist the sound of his lyre. Not even, it seems, the notoriously hard-hearted rulers of Hades. Moved by his music, Persephone, Hades’ wife, told Orpheus he could lead Eurydice’s ghost out of their realm. The only condition was that he not look at her until they both stood in daylight. As he exited the stygian gloom ahead of Eurydice, Orpheus forgot Persephone’s warning. Turning back, his words of longing withered on his lips as the shadowy form of his wife, who was still partially in the shadows, dissolved and blew away on the breeze. As I began my own descent, I marvelled at the man. Not for having the gumption to go to Hell or even for melting the hearts of Lord and Lady Hades. Rather that he had managed to get into the cave at all. Today, the trip is simple. Entry is made via an access tunnel cut into the mountain several decades ago. As it winds its way down to a terrace above the cavern, the tunnel fills with the roar of falling water. On the terrace, that roar becomes a thunder, as the Trigrad River plunges in a fury of froth and foam 42 metres from its upper course to the cavern floor. It isn’t visible from the first terrace but the river is dwarfed by the vast underworld into which it falls. Some 45 metres wide and 110 metres long, the Cavern of Thunder is large enough to fit Sofia’s main cathedral. 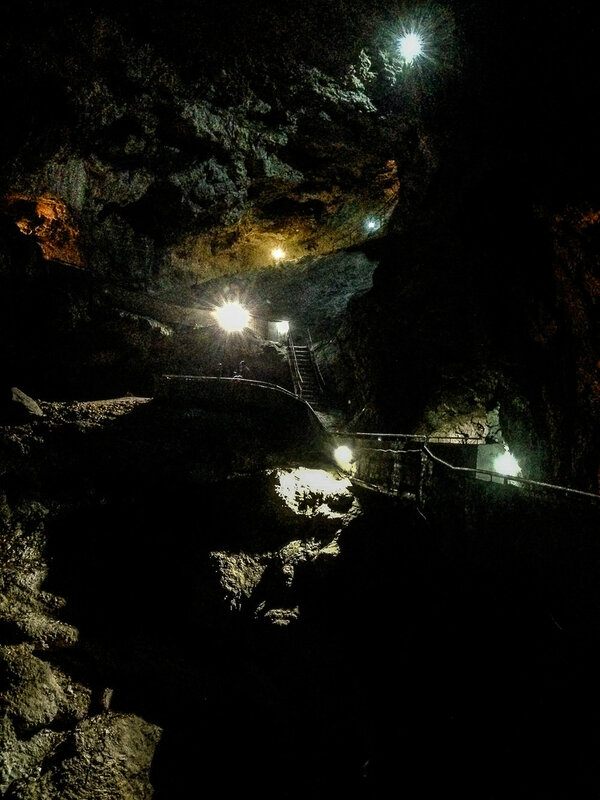 From here, a narrow, switch-backing walkway punctuated by ladder-like staircases, wound down and around the cave, before rising steeply to the surface via the original entrance. This is where Orpheus would have made his descent, a treacherous wall of sheer rock with few visible hand-holds, bathed in slippery spray from the waterfall. Even from below, it seemed a challenge of Augean proportions. Without crampons and a harness? Suicidal. His rescue may have come to naught but as she dissipated on the breeze, Eurydice would have been in no doubt how deeply Orpheus loved her. The cave’s mysteries aren’t all of the mythological kind. After tumbling into the Devil’s Throat, the river meanders swiftly across the cavern floor and disappears under a rock wall. It re-emerges some 600 metres away but nothing solid washed into the cave is ever seen again. Based on the river's rate of flow and the distance between the entry and exit points, dye testing suggests that it travels 20 to 25 kilometres of tunnels before surfacing. Somewhere along the way, anything solid gets trapped, perhaps in another cave. It has swallowed up tree trunks, branches, soft drinks cans and, because several attempts have been made to map the underground network, people, too. The German diver, the last to try in the 1970’s, is still down there somewhere. Nor has a technological approach succeeded. For some reason, possibly surge, possibly sediment in the water, possibly divine intervention, every robot camera sent into the network has stopped transmitting shortly after submerging. Yes, I Wanted to See if He Was Real, Too. The following morning, despite the ominous skies, Shiroka Laka bustled in anticipation of the festival. In a car park at the entrance to the village, performers were shrugging into their costumes and practicing their moves. On the opposite side, the main street was jam-packed with festival-goers browsing street stalls selling devil masks, thick, shaggy sweaters, colourful wool carpets with a kilim vibe and, as is the case in almost every market in the world, cheap and cheerful kitsch from China. The food stalls were also doing a roaring trade. At 10 in the morning, they were already busy dispensing cups of aromatic beef stew, foot-long sausages and plates of kebabs and fries, as well as acid-coloured clouds of candy floss. We’d arrived early to secure a space at the front of the square, where the dancers would be performing. As we had 10 minutes or so to spare and with Darina zealously guarding our space, I decided to lope off for a quick look around. We’d passed through Shiroka Laka several times over the last couple of days, including the night before, when we’d attended a concert by the students at the village’s branch of the National School for Traditional Music and Dance. Milling around in the lobby of the distinctly mid-Century building, an essay in optimistic concrete chic, the colourfully clad and heavily embroidered cast of peasants, beggars, farmer’s wives, dashing horsemen, warriors and gypsy queens, looked more like refugees from a previous era. The singing, though, had been ageless, expert renditions of complex, haunting harmonics instantly familiar to anyone who turned on and tuned in to Le Mystère des Voix Bulgares during the musical wasteland that was the mid-1980’s. Just as I was about to set off for my recce – there was a stone church that had been finished in just 38 days during Bulgaria’s four centuries under Ottoman rule, when new churches were forbidden, as well as a couple of functioning Roman bridges - the air suddenly smelled distinctly but not entirely unpleasantly, of warm goat. Clad in what looked like a full-body version of those shaggy fur coats favoured by rock stars in the late 60’s, one of the animal spirit dancers had arrived. Clutching his furry, peanut-shaped ‘head’ under one arm, he seemed to be out for a pre-performance stroll of his own. Young, raven-haired and ruggedly handsome, he was immediately the centre of everyone’s attention. Phones were fished out. Cameras clicked. Eyes flashing, the dancer popped on his head. The transformation was absolute. With the last trace of humanity hidden beneath a metre-high crown of white and brown goat hair, smiles became expressions of awe. Maybe even fear. Primal, atavistic, this goat-man-yeti set amygdalas ablaze, triggering every single lizard brain in the crowd. As he knew it would. Ambling forwards, he began to swing and shake his upper body slowly from side to side, turning his goaty ensemble into a pulsating whirlwind of long silky hair. Jaws – mine, at least - dropped. That’s when we heard the kavals, a flute played by mountain shepherds from Bulgaria to Azerbaijan. The first troupe had arrived. Dressed in intricately woven wool kilts and aprons, thick stripy socks and embroidered shirts, they wore animal masks. There were goats, bears, eagles, bison and other, less identifiable creatures. Sporting layers of cowbells around their midriffs, they were led into the square by a trio of gypsy musicians, piping and drumming a wild skirl. Forming a large circle, the animal-men began to dance, filling the skies with a shrill jangling. Darina leaned over and told me that this was to drive the evil spirits of winter away, permitting the spring to come. Devils, it seems, don’t like jangling bells. Some of the performers carried icons but the only other sign that today's festival was even nominally monotheistic, was the dishevelled, dusty-looking priest. Sporting an impressive but fake beard, he was a comic figure, his wooden mitre topped not with a crucifix but with a crudely-carved but unmistakable set of male genitalia. He leered at the crowd, showering us in 'holy' water, he dispensed with the flick of a leafy branch. Behind him, in the middle of the circle, a man dragged up as a peasant woman – blonde pigtails, red polka headscarf, smeared make-up – who was walking with her play-husband, suddenly fell to ground. Clutching a hugely pregnant belly, she-he began to simulate labour. After much wailing and moaning, played for maximum comic effect, she gave 'birth' to a plastic baby. The proud father, previously mopping his wife's brow and wringing his hands as the labour pains become more and more exaggerated, paraded his newborn around the square. The jangling stopped and the festival MC, a burly local woman who had been keeping the crowd amused between performances, took this as her cue to announce the blessed event. Winter, she told the happily clapping crowd, had been defeated. Spring had sprung and the harvest, she said, would be very, very good. Rila Monastery, a UNESCO World Heritage site, is home to some of the most psychedelic murals in the Orthodox world.